A bride-to-be’s wedding dress has been slammed online after people called it an ‘absolute nightmare’. The woman was looking for advice on whether she should put in an inlay or leave the middle section of the dress sheer. Her post was then shared in a popular wedding shaming group where it was quickly labelled as a ‘trainwreck’. ‘The only redeeming factor to me is the neckline but it looks like someone cut up six different dresses and stuck them together,’ one person said. People were quick to say the dress didn’t suit her body type and that it should be left to a supermodel. ‘This would only ever be flattering on someone six foot tall with the body of Elle Macpherson,’ one group member said. ‘You have to be extremely thin and tall for those dresses to work and even then it’s a gamble,’ another said. Some commenters said they didn’t think the dress was flattering for anybody, even if they were a highly-sought-after model. Do you like this style of wedding dress? ‘I feel like Jessica Rabbit, a cartoon character, is the only one who could wear this oddly cut dress,’ one woman said. Many group members said the issue was that the dress wasn’t flattering for the woman’s hourglass figure. A former bride explained that she has a similar figure and this style is really hard to look good in. She added that with her own hourglass shape and flat stomach this kind of dress makes her ‘look like a bread stick’. 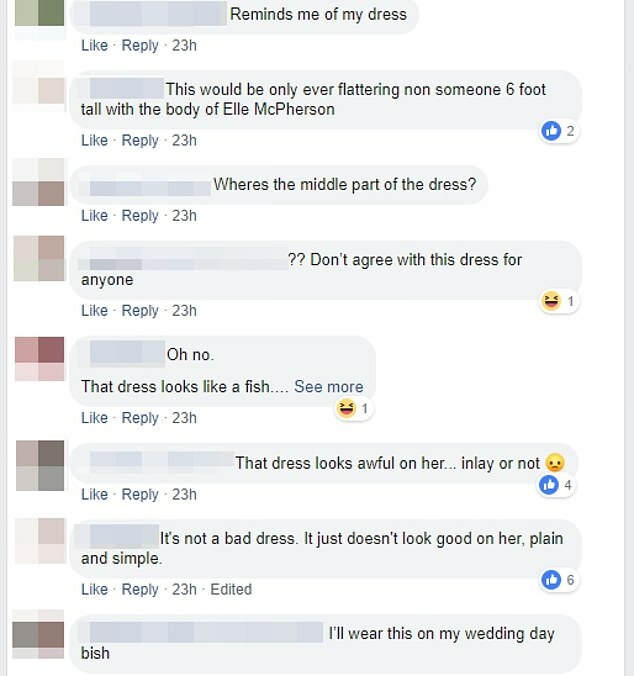 A variety of people offered their suggestions as to how she could make wearing a mermaid dress, which they said was complicated to wear, flattering. 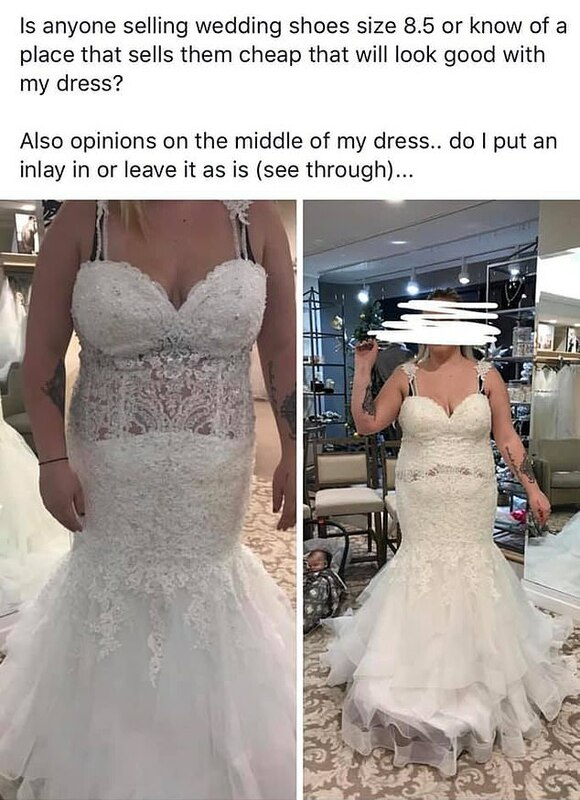 Some commenters said she should either go without the inlay, which they said looked like a ‘weird skin belt’, or find a dress that covers the entire length of the transparent section. ‘Basically any other waistline option for a dress could have looked better,’ a group member said. There were also those who chose to be a bit harsher of their criticism. ‘The dress looks like she is hiding a younger girl inside her, who is also trying on a dress,’ one person said. ‘Just because you can get it on doesn’t mean it fits,’ said another. Many commenters couldn’t believe that a designer would even design this dress in the first place. ‘This is unflattering, where are her friends?’ someone else said.